*SOLD* Just Listed In Okotoks - Check out 'our listings' to see more pictures and view the 3D virtual tour! Gorgeous upgraded 3 bedroom home with bonus room, just steps away from the walking path system & playgrounds. 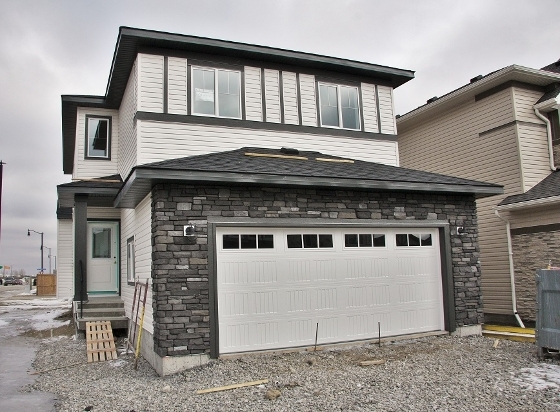 This stunning home features tiled entrance with laminate throughout the rest of the main floor, 9ft ceilings, quartz counters throughout the home and beautiful Samsung Stainless Steel appliance package. The staircase features dark stained maple and iron railings and is finished to the basement. The large living room features a lovely fireplace with huge recess above, tiled surround and shelving either side. The gorgeous kitchen has extended height cabinets, huge quartz island with eating bar and upgraded Samsung stainless steel appliances. The dining area has patio doors leading onto the deck - perfect for entertaining! Upstarirs are 3 spacious bedrooms, the master has a walk in closet and a lovely ensuite with tiled floor, deep soaker tub, dual sinks with quartz counter & separate shower. There is a vaulted bonus room and an upstairs laundry too! Home comes with Alberta New Home Warranty. Please contact us for more details or to book a showing.